15th May 2014 - Michael Dolan had an 8 pound fresh salmon at the Red Shed on a Jonah Lomu. Mike Hegarty also had an 11 pounds salmon at Morrissons and broke in a very big fish. 14th May 2014 - Conor Deffley landed a 9.5 pound salmon on a Green Peter at the Quarry. 12th May 2014 - Manfued Bunzel landed a 9 pound salmon at the Quarry today. 7th May 2014 - Gerard Noika landed an 8 pound salmon at the Yellow House today on a Jaffa. 5th May 2014 - David Nevin had a nice fresh fish of 10 pounds this evening on a Green Peter in Morrissons and rose two more. Photo on Twitter @loughbeltra. 3rd May 2014 - James Burns had a 10 pound salmon in Walsh's bay today and rose four more fish. Eamon Kennedys boat had a fish on the west side of the lake. 1st May 2014 - Brian Hacker and Keith Barry rose two salmon on the lake today. Sebastian McMichael had two salmon today, 8 pound at the dock and 10 pound at the stakes. Dave McClune had a 10 pound salmon at Tommys Wall. 15th April 2014 - Bill Turkington landed a fabulous 15 pound salmon at the mouth of the Glenisland river today on a Yellow Badger. Vinvent Rigney landed and returned a fresh 9 pound salmon at the Red Shed and lost another at the Boathouse. 13th April 2014 - Eamon Kennedy landed a 10 pound salmon at Flannerys and Martin Hughes landed an 8 pound salmon at Morrissons. Frank Burns lost a springer and rose another at the Quarry. 12th April 2014 - Conor Deffley landed an 8 pound salmon on a Hairy Mary at the Dock. 10th April 2014 - 15 pound cracking spring salmon for Brian Gallagher on a Willie gunn at Flanagans Bridge. Fred Finlay lost a fish at the Quarry. 8th April 2014 - Three boats out on the lake today and four salmon to report. Tommy Foley had 2 fish - 8 pound on a Jonah Lomu at Morrissons Point and 10 pound on a green peter at the Strand. Ben Baynes had a sea liced 8 pounder at Faheys on a hairy mary and lost a fish on the next cast, estimated at 12/13 pound, on the same fly. Dave Patton landed a 7/8 pound fish this evening at Flanagans bridge. 3rd April 2014 - Eamonn Kennedy had an 8 pound fish on a Beltra Badger at Flannerys and also lost another. David Edis had a 9.5 pound fish at Walshes Point on a black and red hairwing. 2nd April 2014 - Two visiting anglers landed a fresh salmon each yesterday on a Beltra Badger at Tommys Wall and Clarkes Point. Fish weighed 12 pound and 15 pound. They also lost another salmon each. 1st April 2014 - Jackie Deffley returned a fresh 9 pounder in Walshes Bay on a Beltra Badger yesterday evening. Also a sea liced 6 pounder returned by Brian Gallagher. Members are reminded to report catches on the day of catch and release. 20th March 2014 - An eventful opening day on Beltra today. Ferguson Leydon landed the first salmon of 2014 at Tommys Wall - a lovely fresh fish of c. 10 pound. Rocky Moran and Kevin Beirne both lost fish as well as returning two kelts. Aidan Beirne also returned a kelt. Four boths in total ventured out for the day. 16th February 2014 - Additional images of the Marina development works plus spawning stream enhancements have been added here. A new page has also been added to the gallery with various images from last year. 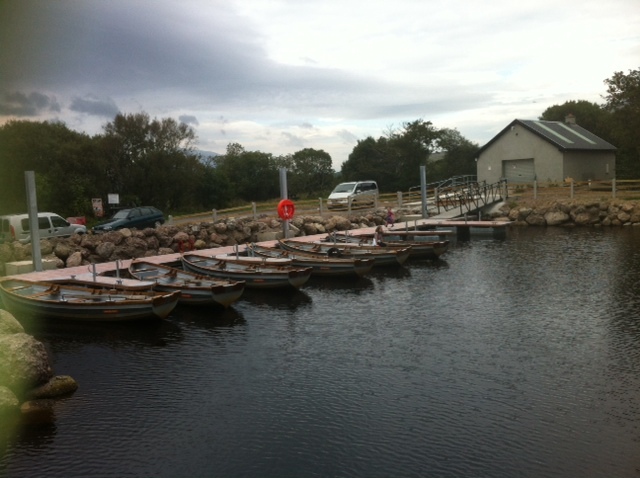 2nd February 2014 - The 2014 fishing season will commence on Lough Beltra on Thursday 20th March. Applications for membership to the Glenisland_Co-op are now being taken. If you would like to fish the West side of Beltra then please contact Newport House. 26th January 2014 - Happy new year to all of our members. Our AGM date will be published shortly and we look forward to seeing all you there. Its been a busy close season with the installation of our new Marina and stream enhancement work. As a result our membership funds are at zero and we are issuing a special SOS to our members to renew as early as possible for 2014. Insurance fees and annual lease is due to be paid now and your co-operation would be much appreciated. Our membership rates have remained the same as last year and payment can be made through this website. Our new marina - all set and ready to go for the new season. 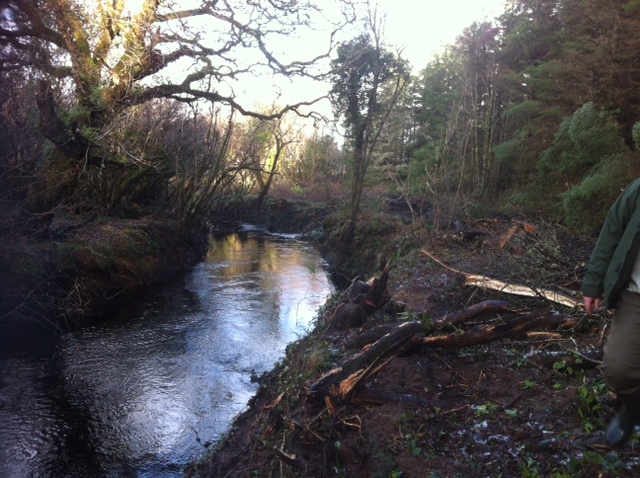 Stream enhancement works undertaken during the close season.